The Easter Concert is now being held on Wednesday 10th and not Thursday 11th as stated on the school calendar. 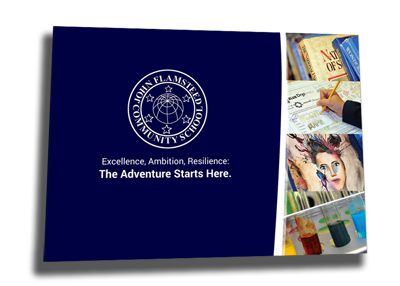 Thank you for looking at our school website and I welcome you most warmly to the John Flamsteed Community School family. I am tremendously proud of the achievements of our wonderful school and I am delighted that students flourish here both academically and from all other spheres of life whether it be on a regional, national or international stage. Our school motto, ‘Excellence, Ambition and Resilience’ really does encapsulate the vision that the Governors and I share for every child; we strive towards academic excellence, we are ambitious for every child’s future and we ensure that every student understands that resilience – the ability to keep going no matter what – is the key to success and happiness both in school and in life. We are an ambitious community and our attractive uniform, reflecting our patron’s interest in the night sky (John Flamsteed was the first Astronomer Royal), with navy representing the sky and silver representing the stars, is an example of this ambition. As the Headteacher of this school, I am always pleased to hear positive comments about how smart our students are as this reflects their positive behaviour both in and outside of school. I am delighted that our most recent Ofsted report (January 2016) judged the school as ‘Good’ in all areas of inspection. The most recent examination results are clear evidence of this. Nonetheless, we must never be complacent, and on 1 April 2016, we joined the East Midlands Education Trust so that, in part, we can be partners with the West Bridgford School – an Outstanding school in Nottinghamshire – which will, I am sure, support us in achieving our own goal to be Outstanding in every area of inspection. This partnership will also help me to achieve a personal ambition that I have for the school – to have our own Sixth Form – I simply do not want to say goodbye to our wonderful Year 11 students who are an absolute delight and who make exemplary role models for younger students. With a background in senior leadership in Sixth Form education, I know that our Year 11 students could aspire to go to the best universities in the country, including Oxford and Cambridge. Our joint Sixth Form provision, the Amber Valley Sixth Form, is another exciting development in the history of the school as we see our offer for Year 12 and Year 13 students expand. If there were a single factor that I had to choose that made John Flamsteed Community School unique, I would say that it had to be the quality of the teaching. We have a Deputy Headteacher with the specific brief to lead teaching and learning across the school and under her expert guidance, all teachers have adopted an ‘Accelerated Learning’ model to their teaching. This means that every single lesson requires for a series of activities rather than one long one, with pace and stretch at the centre of the learning experience. I am convinced that this approach has led to and will continue to lead to a further improvement in standards. In fact, as seen in our Ofsted report, excellent teaching and learning was observed in many different subject areas. I hope that this website gives you a flavour of our school. We are in the unique position that our traditional ‘catchment area’ only accounts for 50% of our admissions (we have more fields in our catchment area than housing!) and we are delighted to admit children from a variety of local Primary schools stretching to those within roughly a 8 kilometre radius of our school. Do have a look at our prospectus on the front page for a more detailed picture of our wonderful school. If you are interested in applying for a place for your child either mid-year or for the beginning of an academic year the application form can be found on the front page of the website or alternatively, please contact our admissions officer, Mrs Stephenson for information on stephensonj@jfcs.org.uk. Alternatively, you may wish to look around the school first so that you can see us how we really are on a typical working day. Please contact our reception team to arrange a tour (these usually take place on Friday mornings but we will be happy to accommodate you on another day if Friday is problematic for you). If your precious child or children are fortunate enough to be a part of John Flamsteed Community School, I give you my personal pledge that our whole school community will strive to do our very best to ensure that they receive first class education that will help shape their future lives as successful, fulfilled and confident adults, whatever their starting points. I ask the students at John Flamsteed to dare to dream about their futures. What will your child’s dream be? Mid-Year Applications Online will be available in the near future. In the meantime you can download our Application Form. For hard copies of any of our documents, please contact reception. Any problems? Please contact Mrs Harrison or Miss Campbell in Student Services. 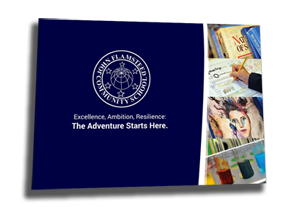 Keep up with the latest School news and information by following us on Twitter @johnflamsteed. Like us on Facebook to get School news directly to your feed. © 2015. John Flamsteed Community School. Your device may be a little small to view the calendar. Would you like to see a list of upcoming events instead?